Sept. 27, 2018 -- On Thursday, the FDA approved a low-dose version of Symjepi, an injected epinephrine to treat life-threatening allergies. The new alternative, when available, may ease ongoing shortages of other epinephrine products such as Epi-Pen. While the Epi-Pen, and others like Auvi-Q, is an auto-injected device, Symjepi is a prefilled injection syringe, so experts expect it to take time for users to get used to the new device, which aims to prevent the life-threating allergic reaction known as anaphylaxis. In a statement, Dennis J. Carlo, PhD, president and CEO of Adamis Pharmaceuticals, which will market the device with Sandoz, says: ''With all of the reported shortages of epinephrine products, we believe that there is a great opportunity for a simple, easy-to-use device like Symjepi within the anaphylaxis market." The latest Symjepi will be available “as soon as possible,” Carol Lynch, president of Sandoz, says in a statement. “Today’s approval of Symjepi in the pediatric setting is a huge step forward to treat children at increased risk for anaphylaxis as it represents an affordable alternative to current treatment offerings at a time when patients need access to this medicine most,” Lynch says. The higher-dose version of Symjepi, at .30 milligrams, was approved in 2017 but is not yet available. In mid-August, the FDA also approved a generic EpiPen version in two strengths -- .15 and .30 milligrams -- from Teva Pharmaceuticals. Mylan's EpiPen continues to be in short supply, but the company says it is shipping the drugs as soon as it gets them from their partners, Pfizer and Meridian. 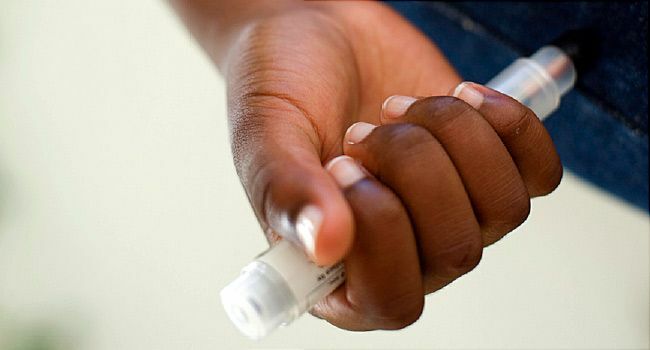 The ongoing EpiPen shortage, along with drugmaker Mylan's price increases, has caused problems, especially as the school year starts and parents are expected to supply their schools with new epinephrine devices. The FDA announced in August that it is extending the expiration date on some batches of EpiPens by 4 months to try to help people struggling with the shortage. Up to 15 million Americans have food allergies, according to Food Allergy Research and Education (FARE), including about 5.9 million children under age 18, or 1 in 13 children. Many others are allergic to medication, latex, insect stings, or other triggers that can cause a sudden, potentially life-threatening reaction called anaphylaxis. Prompt administration of epinephrine is lifesaving. "An alternative delivery method, affordable and available, is very welcome," says Jefry Biehler, MD, chairman of pediatrics at Nicklaus Children's Hospital, Miami. "The high cost of autoinjectors [such as Epi-Pen and Auvi-Q] for the delivery of a low-cost medication has certainly impacted availability for many who would benefit from their use," he says. ''The FDA has recently taken a number of actions, including approval of the Symjepi and Teva's generic EpiPen, that will result in greater competition and help meet the needs of patients at risk for anaphylaxis," says Lisa Gable, CEO of FARE. "We welcome these developments and are hopeful that the availability of new products on the market will alleviate the epinephrine auto-injector shortage problem, which has remained unresolved since May, leaving many families desperate to find this lifesaving medication." Gable says users of the new Symjepi will have to learn to use a prefilled syringe rather than an auto-injector. "Training will be essential for those who opt to use the Symjepi device," she says. "It will be critically important for schools to train staff on all devices so that they are prepared to treat anaphylactic reactions swiftly, no matter which type of device a student has on hand." She also suggests that people who are managing allergies, both adults and parents of children, talk to their doctor about which device might work best for them.